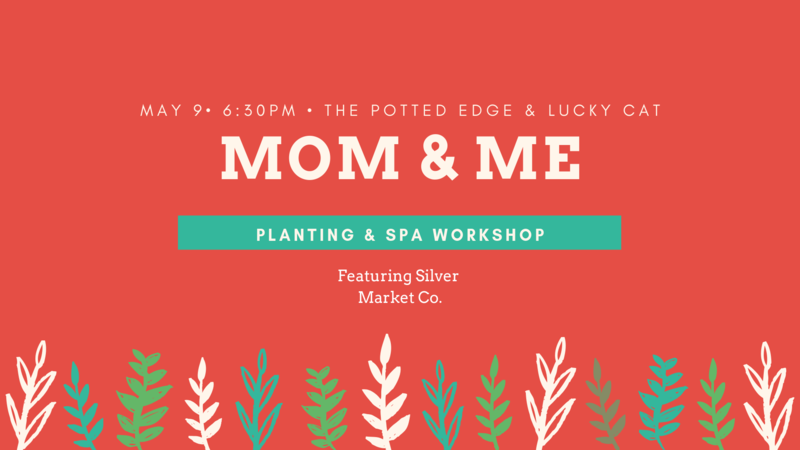 The Potted Edge & Lucky Cat Design Co.
Join us for a Mother’s Day workshop at The Potted Edge & Lucky Cat Design Co. Mom and daughter will plant their very own succulent arrangement! Learn how to care for these beautiful plants as we teach you styling and planting techniques, and take home a beautiful arrangement you did yourself! You will also receive a spa experience with Kelsi of Silver Market Co. While here, take home a new Lucky Cat Design shirt as well! A variety of hardy succulents to choose from – A chic, modern container – Top dressing including rocks , sand and pebbles – Succulent & cacti soil. Spa Experience with Kelsi of Silver Market Co.
New Lucky Cat Design Co t-shirt.